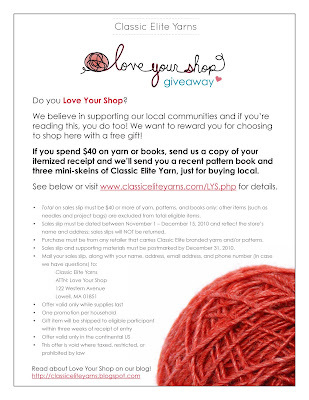 Our Love Your Shop promotion has been a huge success! Thank you for mobilizing and supporting local yarn shops, they are the lifeblood of our community. The only way to make sure the LYS is here to stay is to support your local shop! You still have time to enter if you haven't already, sales slips can be dated between November 1st and December 15. Make sure you drop them in the mail before the end of the year. Click the image above for a full page printable flyer your shop can display...let's go out with a bang! And now, on the eve of the last shopping weekend, we wanted to share some statistics with you. The knitters and crocheters have spoken! We have received a total of of 864 receipts. The total dollar amount of qualifying merchandise is $62,531! We have received entries from 44 different states and DC. Massachusetts is in the lead with the most entries at 73. Next are Wisconsin (56), California (53) and Michigan (51). You have 5 more days, get out there and buy some yarn! That's really funny - I hit my LYS last night, intending to just buy a bit and bump my total over $40 (I already had a couple small purchases). Instead, I wound up spending $74.37! It cracks me up that my receipt will be within $1 of the average...LOL. Hmmm, I sent in my receipt approx 4 weeks ago, but as of yet, have not received my free items. My purchase was from a CEY listed yarn shop, it fell within the dates specified, & it exceeded purchase amount required. Purchase was for yarn only, so nothing fell into the exception catergories. My understanding per comments on ravelry & in reading the above flyer, was that it did not have to be CEY yarns or books, just from a LYS who was a CEY retailer. bschlot, sounds like you did everything right. We are steadily working through our very long list of participants, I apologize for the delay! You can email me directly at chelsea at classiceliteyarns dot com and I'll be happy to ensure that we received your information. Wheee, just received my goodies in the mail today! Thanks Chelsea for offering to help. It's like that old adage of someone looking over your shoulder to find what you think you've lost. A huge thanks to CEY for being so generous with this promotion. The gifts are quite a source of inspiration. Gauge and Yarn Substitution, Part Two-Swatching! Cowl Girls Review and Yarn Giveaway! Free Patterns+23 Days=Last Minute Gifts!